First prepare the chicken filling - Cook chicken adding little pepper powder and salt. Shred it and keep it aside. Heat little oil in a pan, add onion and saute till soft. Add ginger, green chillies, curry leaves, turmeric powder, garam masala and salt and saute well. Add shredded chicken into this and mix well. Keep it aside. In a bowl, add plain flour, yeast, powdered milk, powdered sugar, salt, oil and 1 egg, mix well and knead to a medium soft dough adding slightly warm water. Leave it to rise for 1 hour. Divide the dough into 8 equal balls and roll out each ball to about 4" diameter disc. Make 4 diagonal slits and add the filling in the centre. 7. Take one portion and cover the side of the filling with it. 8.Take the opposite portion and cover the other side of the filling with it. dough on the sides to seal it. 10. Place the prepared rolls on a greased tray. Preheat the oven to 180 degree celcius. Brush each prepared rose with little milk and sprinkle with sesame seeds. Love the shape of the rolls. Aptly named..
That's a unique super idea Shabbu..Indeed valuable recipe ! They really look so decorative..even I have bookmarked to make them. Very innovative, love this rose shaped roll. very pretty! perfect for party. Great idea!! 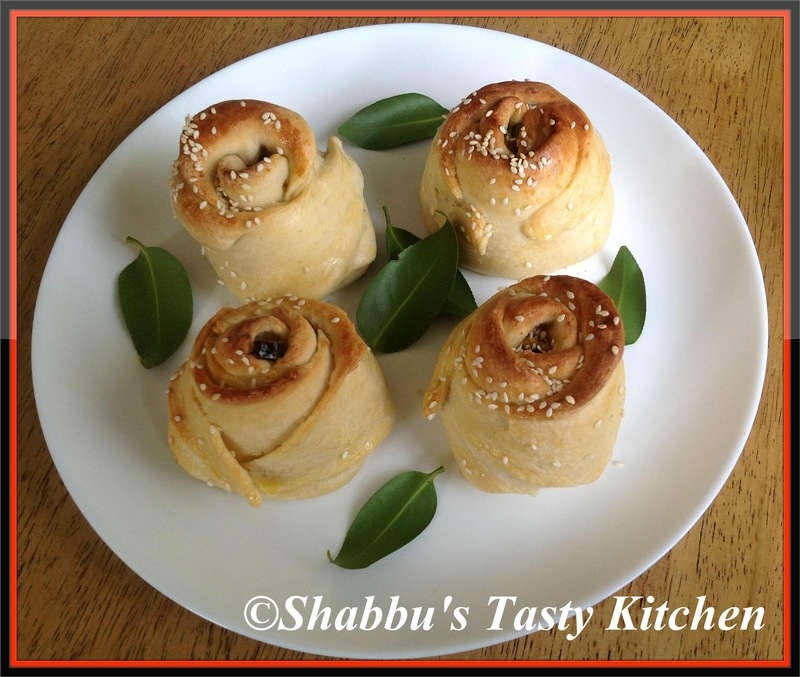 those chicken rose rolls looks delicious n Pretty...well made!! Wow!! Awesome rolls recipe!! Looks scrumptious!! Loved the idea. It looks really yummy! I will try it with vegetarian filling. 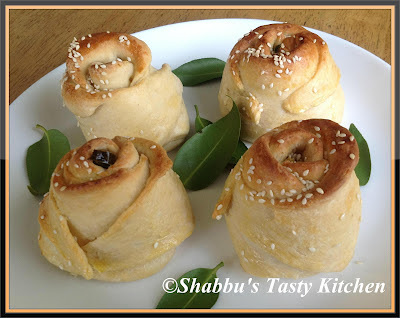 Hi I hopped over from Sadaf's blog...these chicken rolls look so good...cheers Suchi! Beauty!! These rolls are ready to be taken down. Saw your entree at Sadaf's blog event. Glad it brought me here. wow wow wow!!! how in the world did i miss this psot. bookmarked..super like !!! 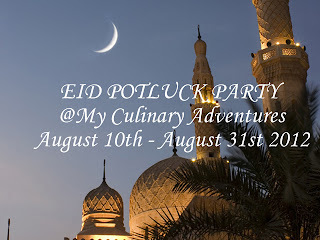 And..hey, do drop by my "pick-quics (non foodie blog) if you are in for some real hearty laugh. 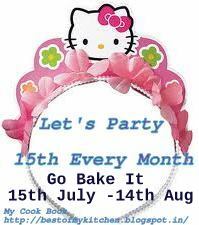 I wish to make these rolls in a big quantity for my iftar party soon...can I make them and freeze, 2 or 3 days before my party and just take them out n brush them with milk and bake them, in order to save time? Please visit the below link for detailed explanation of how to freeze them..